John Croft was born on the 18th June 1932 in Oulton Broad, Suffolk where he has lived all of his life; John worked for the Brooke Marine Shipyard in Lowestoft until retirement. 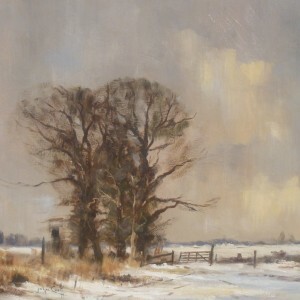 John was always interested in art and particularly the work of Edward Seago and being a self taught artist he began painting seriously in the early 1970’s and soon discovered that his work quickly sold to eager buyers. He was a member of the Lowestoft Art Group and his work was regularly hung in Norwich where he had sell out exhibitions as well as successful showings at the James Paget Hospital in Great Yarmouth. John painted in both oil and watercolour and the surrounding countryside provided an abundance of subject matter. His atmospheric paintings using a loose brush and impressionist style follows in the tradition of the Norfolk and Suffolk school of painters.